Partisans and Chetniks – strength and organization of irregular forces in Russia and Yugoslavia. 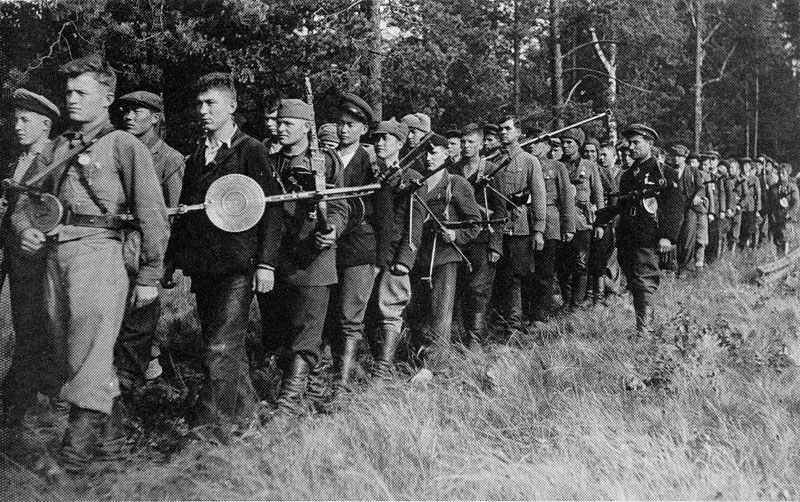 Partisan unit in Byelorussia in 1942. The rapid disintegration of the Red Army along the western frontiers of the Soviet Union as a result of the Axis invasion in June 1941 took not only the Germans, but also the Soviet Government completely by surprise. The German Army captured literally hundreds of thousands of Red Army soldiers who they could neither feed nor house, let alone guard. Thousands more avoided capture or escaped from German captivity and went into hiding. In many areas, particularly the Ukraine, the Germans were at first welcomed as liberators. The Russian people reacted cautiously to their new masters, and remained passive as long as they were not directly threatened or maltreated. In the hinterland groups of Soviet soldiery and party officials roamed the countryside or established themselves in the vast forests of the western Soviet Union. The department responsible for organising partisan resistance behind the German lines was part of the NKVD, and it began to parachute operatives behind the German lines in areas where large partisan bands were known to be concentrated. The problem was that some of these partisan bands were actively anti-Bolshevik, others anti-German, and others still were engaged in simple banditry. While Germany was winning the war there was a definite reluctance to mount operations against the occupying forces; but as soon as stories of Axis brutality began to circulate and the Germans suffered their first defeats, there was a dramatic increase in partisan activity. In August 1943 there were, for example, 24,500 partisans in the Ukraine alone, of whom 5,000 were Communist Party members. In the whole of the Soviet Union there are estimated to have been two million partisans and resistance fighters. In response the German authorities fielded about 25 divisions (327,543 SS, security police and normal policemen and 500,000 auxiliary policemen): an immense drain on resources. Partisan losses were estimated at 85,000, 70,000 of whom were shot while 15,000 died in concentration and forced labour camps. There was no such thing as a partisan uniform, and whatever clothing was available was gladly worn, there being an acute shortage of clothing in the Soviet Union. Ever-increasing use was made of captured clothing and equipment, particularly after the huge defeats inflicted on the Axis armies following Stalingrad. 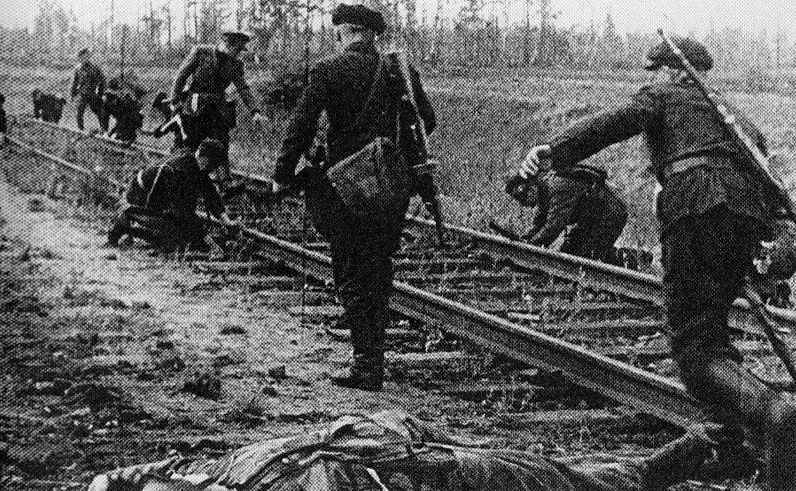 The most important business of the Partisans in Russia were the mining of railway tracks. In response to the partisans the German authorities fielded about 25 divisions (327,543 SS, security police and normal policemen and 500,000 auxiliary policemen): an immense drain on resources. 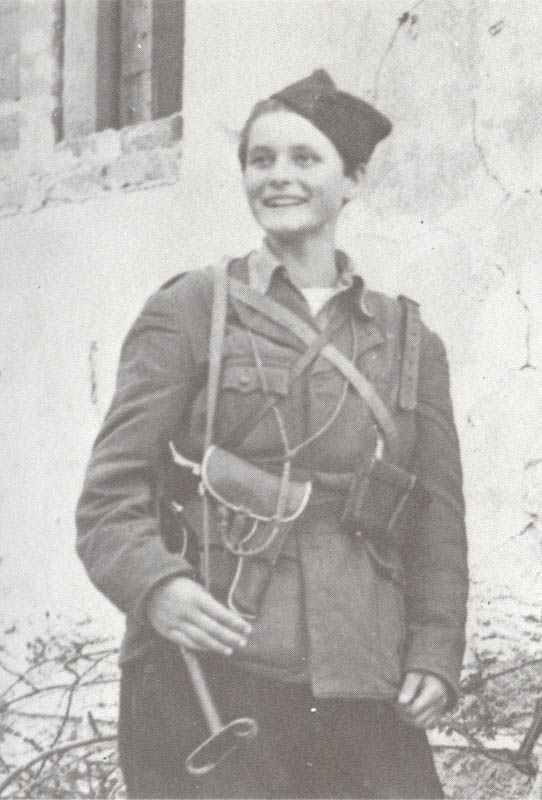 A Yugoslav partisan woman soldier, during a Communist Party Congress. She has a British Sten gun, but the rest of the equipment is German and Russian. When the Axis forces invaded Yugoslavia in April 1941, the Yugoslav Communist Party was still suffering from the effects of governmental repression, and thus its membership did not exceed 12,000. Almost as soon as the country was occupied, Communist cells and Yugoslav soldiers who had refused the order to surrender combined to form the nucleus of a partisan movement under the leadership of the General Secretary of the Communist Party Josip Broz – better known as Tito. At first Tito’s partisans were almost exclusively Serbs, and it was not until 1943 that Slovenes and Croats began to join in any numbers. Initially Tito’s operations were not particularly successful, so he decided to re-organise his forces as a proper army. On 21 December 1941 Tito created the first regular unit, the 1st Proletarian Brigade, and by mid-1942 had formed a further three brigades in what was now known as the Yugoslav People’s Liberation Army. Until the arrival of the first British Military Mission to be accredited to Tito at the end of 1942, he had received no outside support. All his weapons, ammunition, supplies and uniforms were either from pre-war Yugoslav Army stocks or taken from the civilian population or occupying forces. The first Allied air-drop to Tito’s partisans was made on 25 June 1943, and with his supply channel secured Tito was able to expand his partisan army into four army corps, one for each quarter of the country, with 306,000 men and women under arms. By May 1944 the Liberation Army had grown to half a million partisans and there were 21 training schools for officers and NCOs. At the same time, all British personnel were withdrawn from the Chetniks and Tito was now recognised by all the Allies as the de facto ruler of Yugoslavia. The military organization of a partisan army must perforce be fluid, and on the whole organised in smaller units than a regular army. Establishments and weapons scales would vary from day to day, since the difficulty in supplying widely dispersed units who chose deliberately inaccessible places for their bases presented enormous difficulties. The smallest unit was a company with about 80 men. Nine companies formed a battalion, while three battalions formed a brigade (approx. 2,160 men). Three brigades, each with a mountain artillery and heavy weapons battalions, formed a division (approx. 7,000 men). On 1 January 1945 Tito regrouped his 800,000-strong army into four Army Groups and, having cleared most of Yugoslavia of Axis troops and collaborators, he ordered his 4th Army Group to occupy Trieste ahead of the Western Allies. They entered Trieste on 1 May 1945 and occupied Italian territory as far as the Isonzo River. Chetniks display some of their equipment and weapons. They are basically wearing the uniform of the former Royal Yugoslav Army, although considerable modification has taken place under the strain of war. Having defeated the Royal Yugoslav Army and occupied Serbia, the German forces were rapidly withdrawn to prepare for the coming invasion of the Soviet Union. This meant that the mopping-up and disarming of the Yugoslav Army was hurried and incomplete. Some 15,000 of the 300,000 men who had refused to surrender – mostly Serbs – began to organise themselves into what was officially known as the Officers’ Movement, organised by the Royal Yugoslav Army general staff colonel, Dragoljub ‘Draza’ Mihailovic. The movement was better-known as the Chetniks. In the meantime the young King Peter had established a government-in-exile under British patronage, but the forces at his disposal in the Middle East were so insignificant that he decided to promote Mihailovic to the rank of general and appoint him Minister of War. 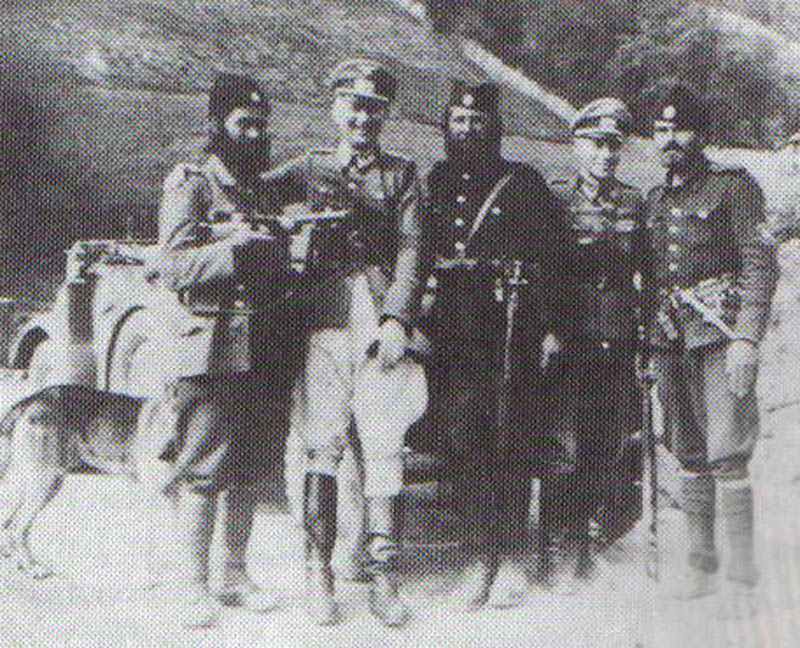 The Chetniks thus became the Royal Yugoslav Army in the Homeland. Three Chetniks pose with two German officers in 1944. At first there were attempts to unify the Chetniks and Partisans, but such attempts failed; indeed Chetniks and Partisans often displayed more hostility to each other than to the occupying forces. Rumours of collaboration and lack of activity of the Chetniks were to lead the British to remove their support from Mihailovic in May 1944. He was shot by the communists in 1946. The Royal Yugoslav Army in the Homeland was, in theory at least, organised on standard army lines. A corps consisted of a headquarters and two to six brigades, its strength varying from 1,200 to 9,000 men. The brigade likewise varied in size being composed of from four to six battalions with signals, medical, engineer and supply units. Each Chetnik battalion had a headquarters and three to five companies, each of which was made up of five 50-strong platoons. The best men in the Royal Yugoslav Army were concentrated in the assault brigades which were used to carry out the most hazardous operations. The honorary title, ‘assault’ was awarded to the best brigades in recognition of particularly brave and successful conduct. 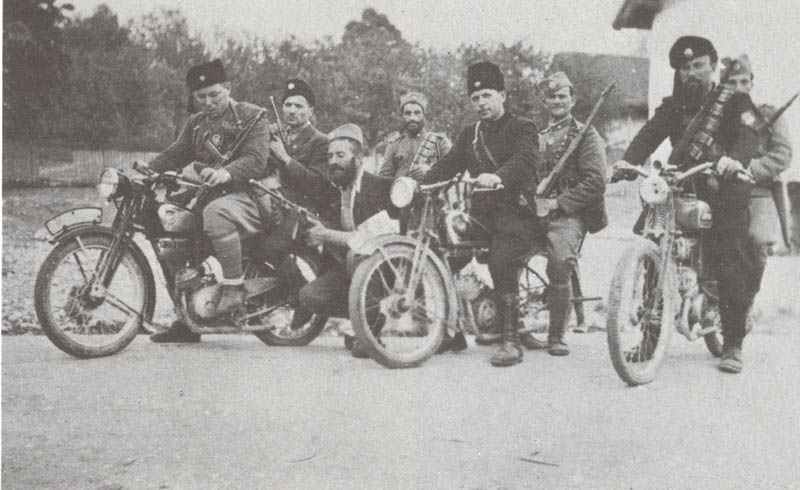 The Chetnik territorial troops consisted of older men and women who were not called upon to operate outside their home district. They were responsible for the security of their villages and represented the military and administrative authority. It also included members of the former frontier guards and police. In case of attack the garrison battalions would defend prepared positions, while mobile units would endeavour to attack the enemy forces in the rear or on the flanks. Check your facts, and official documents from this time. Those were not rumors, at all.